We begin with warm-ups. Today was Scattegories which lead to the vocab words QUAINT and BAMBOOZLING. Next up was an introduction to the story of Maine's own Samantha Smith and the impact that a fifth grader cab have through the power of writing. Her letter to Yuri Andropov and his response were meaningful actions that ripple beyond the mid 80's. We all agreed that the pen IS mightier than the sword and that kids can make BIG differences. This mini lesson ties in to the Opinion Piece writing that is going on in the regular classrooms. 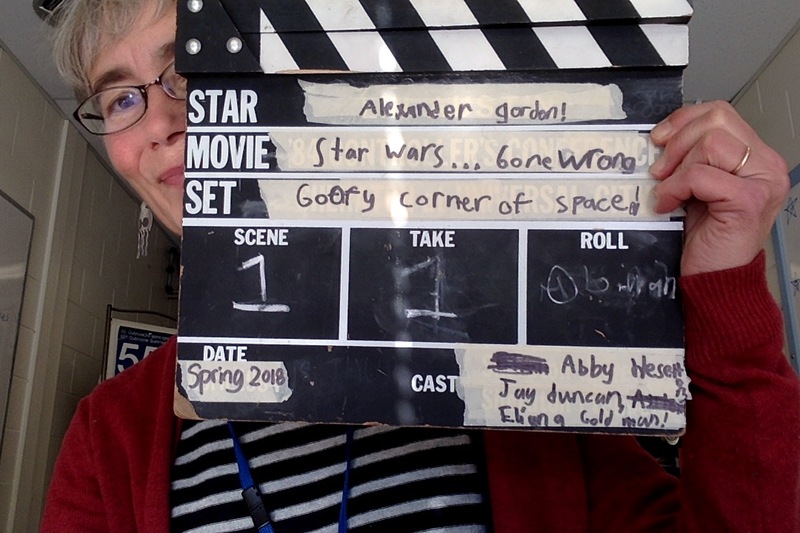 During Choice Time, all of the kids worked on the "Star Wars Gone Wrong" movie. Note the authentic(ish) movie clapper above! They are responsible for all of it: script/set/shooting/editing. This project, given our short time together, may well last a while. There is a google.doc shared amongst the students upon which they might work during free time at home, IF they are so motivated. They seem to be headed deep into SPOOF territory. Please note the Open House: Thursday, Jan. 25th, 6-7 at the HMS Library. This event is for parents and guardians, not the students themselves. Come if you can, or visit our district Instructional Support website (find us right in the middle! ).